For the last month I’ve been accepting entries to my blog’s stem cell video contest. This video contest follows up on other fund and educational contests I’ve run with prizes including a stem cell essay contest. In addition I do an annual Stem Cell Person of the Year Award with a $1,000 prize, which I personally pay myself to the winner. These are all part of my way of giving back and promoting the stem cell field and good citizenship (read about my 2013 winner here). Stay tuned for our Stem Cell Person of the Year 2014 event, which will have a surprising new twist. So how did our video contest turn out? We had numerous entries out of which I picked the top four to show below. It was an especially close call between the top two winners as to who would prevail. Congrats to Robert Zehner who has won the grand $100 prize in the form of an Amazon gift card! 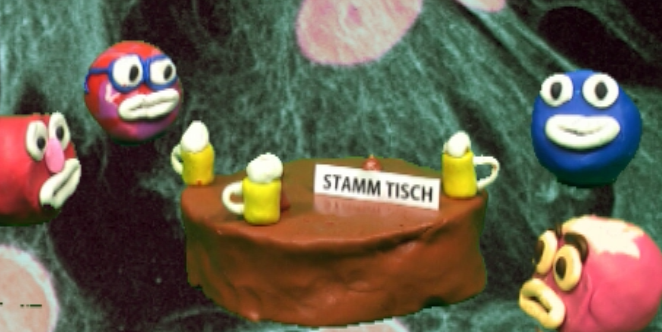 I found his claymation video (above in German with English subtitles) to be captivating and just downright fun. I love the outtakes/bloopers at the end too so stay tuned for those towards the last part of the video. Admittedly, his take on the stem cell world is extremely optimistic, but his enthusiasm is contagious. CIRM’s Todd Dubnicoff and Kevin McCormack take second prize. They also provided a very well-done entry on using iPS cells to model ALS in a dish. Well done! Their video is above. Third places goes to Bill Pfohl, who submitted a very cool stem cell rap video (below). Emily Easto, Communications Coordinator, at the Centre for Commercialization of Regenerative Medicine (CCRM) also entered our stem cell video contest and finished fourth. Her video, entitled CCRM Innovations: Cell Culture Bioreactors, also really wowed me (see below). I created this video in collaboration with Dr. Elizabeth Csaszar, Development Scientist at CCRM, to show how cell culture with bioreactors is an essential step on the road towards commercializing regenerative medicine therapies. I believe this to be an accessible video that accurately and effectively explains the bioreactor’s role in the future of regenerative medicine and because there are no other comparable videos on cell culture with bioreactors, it is a useful education tool as well. All these videos are great. Thanks for entering! Congrats to all and especially our winner, Robert! Congratulations to the lucky winner of the blog prize, which we were happy to support. We hope that they enjoy the $100 gift card! The Axol Bioscience team! How expensive are the bio reactors. Would they be useful for meeting regulatory standards in the clinic? Love the great entries and think they are all winners and excellent science communicators! especially the videos are amazing.